Where do I use my SpaBreaks voucher code? Choose a Spa Breaks code you would like to use. Click on it and copy the code then follow our link to the SpaBreaks website. Choose a spa you would like to visit, tell them how many there will be in your party then choose a suitable date before clicking continue. On the next step (your details) you can enter your promo code into the section in the bottom right-hand corner of the screen (shown above). Click 'Apply' and your discount will be automatically applied to your order total. "Scan the Special Offers section for an unbeatable range of spa days/trips at impressive prices." "Treat yourself to a spa-trip sooner rather than later whilst enjoying a massive discount on your booking when you catch a deal of the Last Minute offers section." "Sign up to Spa Breaks’ newsletter service and be first in line to hear about the latest news, offers and discounts." Established in 2001, Spa Breaks have proudly attained over sixteen years experience in arranging successful spa-days and breaks for their customers. Developing into the UK’s largest spa-travel company, with over 75+ specially trained staff, has helped them to achieve more of what they do best, providing a broad range of quality spa options, whilst striving to provide competitive prices for their customers. Working with over 700 venues in the country, across all major regions means you’ll struggle to find a better range of spas anywhere else so nearby. Over 5000 trips are booked and organised every week with Spa Breaks, be sure to book early to get the best possible price and deal for your short getaway. 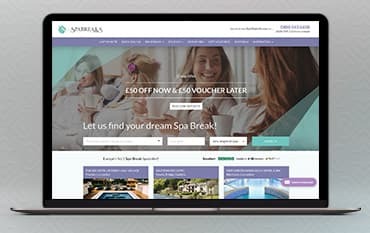 Organising your dream spa trip couldn’t be easier when using the Spa Breaks website, simply enter your postcode/region, preferred dates and length of stay, then press search and allow Spa Breaks to do all of the hard work for you. If you’d prefer to browse through the available venue options yourself then check out the ‘Spa Breaks’ or ‘Spa Days’ tabs featured on the website, here you can conveniently find venues via specific region - perfect for if you’re planning a trip outside of your usual residence. Treating yourself or a loved one to a spa outing shouldn’t have to break your bank, fortunately, Spa Breaks give their customers the means to save when booking their day-out or trip; Browse through the ‘Last Minute’ deals or ‘Special Offers’ section to find a whole range of trips with great discounts. Looking to bag yourself a bargain break within the near future? Luckily Spa Breaks is home to an amazing last minute deals category, filled to the brim with breaks and getaways all at greatly reduced prices. All of the same beautiful venues can be found within this section, simply reduced to avoid underbooking - treat you and a loved one to a well-deserved rest whilst saving yourself money. All of the deals featured are planned for the next 30 days and are by nature in limited availability - so act fast and don’t miss out! Save yourself a fortune and book with one of Spa Breaks’ special offers. Everything that can be found within the ‘Special Offers’ section is either placed at a temptingly low price point or includes fantastic extras alongside the booking such as extra meals, cash allowances towards the in-house restaurants or extra nights stay. Similarly to booking normally, you can specify where and how long you wish to stay, in addition to listing it through cheapest to most expensive - ideal for if you’re shopping on a budget. Spa Days out can be found as low as £30 or less within the special offers section, amazing value for that extra special gift to yourself or a friend. How can I contact Spa Breaks? What hours is your sales team open? Can I go on a spa break if I'm pregnant? In your first trimester: you should avoid massages, the Jacuzzi, sauna, steam room and aromatherapy, or anything else that puts pressure on the stomach. However you can enjoy lots of other gentle treatments like facials, manicures, pedicures and head massages. After 13 weeks: it is always a little dependent on the individual pregnancy, but it should be ok to use most facilities at this stage. Nonetheless, still avoid over stimulating treatments like aromatherapy and deep tissue massages. Spa Breaks is your go-to destination when considering booking any spa-day or trip - armed with a team of professional spa-gurus and consultants, working with a massive catalogue of venues spanning all across the country. Spa Breaks is the United Kingdom’s largest spa travel company, bringing with it a range of advantages you can’t find from any other travel company of its kind: expert advice, the best prices and unbeatable service. Accommodating all types of excursions such as spa-breaks, spa-days, group events or hen-parties, there is something available for every occasion. There are many ways to save when booking with Spa Breaks such as special offers for groups/hen-parties or last minute deals, with even more savings available when you shop with a Spa Breaks voucher code from us.